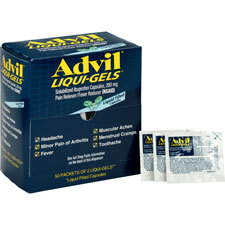 Advil Liqui-Gels are liquid-filled capsules that are clinically proven to work faster and stronger on tough pain. Liqui-Gels with Ibuprofen provide up to 8 hours of continuous pain relief. Each dose of two tablets comes individually wrapped. 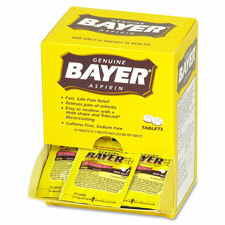 Bayer Aspirin refills are ideal to replenish first aid kits. 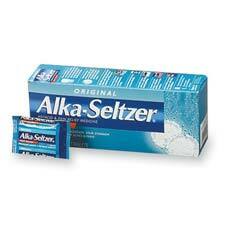 Caffeine-free, sodium-free tablets act as a pain reliever and fever reducer. 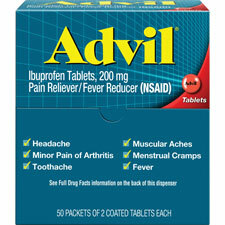 Bayer Aspirin temporarily relieves headaches, toothaches, and minor aches and pains. Each dose of two tablets is individually wrapped. Trip Antibiotic Ointment protects you from germs that may infect a wound. It is frequently included in basic first aid kits. Ointment is packaged in single-use packets for hygiene and convenience. 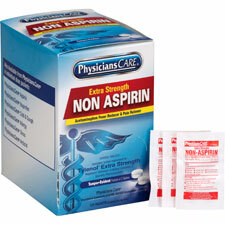 Nonaspirin (Acetaminophen) acts as a pain reliever and fever reducer. Tablets do not contain aspirin. Each dose of two tablets is individually wrapped.